NASA's budget request for the 2014 fiscal year may include plans for an ambitious mission to send a robotic probe into deep space, capture an asteroid and haul it back within the reach of astronaut explorers, according to a press report. The space agency is apparently including a request for $100 million in its 2014 budget request to help fund the audacious asteroid capture mission, according to an Aviation Week report. The asteroid- retrieval mission was first proposed last year by the Keck Institute for Space Studies at the California Institute of Technology in Pasadena. That study, released last April, revolved around an Asteroid Capture and Return mission that would snag a 25-foot wide (7 meters) space rock and place it in high lunar orbit by 2025 — the deadline set by the Obama administration for NASA's human mission to an asteroid. Total estimated cost of the asteroid mission: $2.6 billion. "There are many options — and many routes — being discussed on our way to the Red Planet," Bob Jacobs, deputy associate administrator for the Office of Communications at NASA Headquarters in Washington, D.C., told SPACE.com via email at the time. "NASA and the agency's Jet Propulsion Laboratory are giving the study further review to determine its feasibility." NASA officials told SPACE.com today (March 29) that they cannot comment on details of the agency's 2014 budget request until the Obama administration unveils the complete federal budget request on April 10. According to the Aviation Week report by veteran space writer Frank Morring, Jr., NASA will include a request for funding in its 2014 budget request for just such a mission in order to bring a small asteroid within reach of astronauts flying on the agency's Orion deep space capsule. The $100 million in funding would be divided among NASA's human spaceflight, science and space technology divisions, Morring wrote. Scientists who participated in the Keck study spoke before a National Research Council human spaceflight technical feasibility panel on March 28, describing the target as asteroid as essential "dried mudball" rather than a threatening space rock, Morring wrote. President Barack Obama announced NASA's asteroid goal in April 2010 during a speech at the space agency's Kennedy Space Center in Cape Canaveral, Fla. That year, he cancelled NASA's moon-oriented Constellation program and called on the space agency to launch a manned mission to an asteroid by 2025, then aim to send astronauts on a Mars-bound mission in the mid-2030s. The Keck study released last year cited a near-Earth asteroid capture mission as a potential gateway to manned Mars exploration. "Experience gained via human expeditions to the small returned NEA would transfer directly to follow-on international expeditions beyond the Earth-moon system: to other near-Earth asteroids, [the Mars moons] Phobos and Deimos, Mars and potentially someday to the main asteroid belt," the mission concept team wrote in the study. 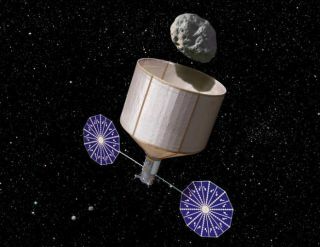 Since the Keck study's release, two U.S. companies have announced plans to send private missions to asteroids as space mining ventures. The firms, Planetary Resources Inc., in Seattle and the new company Deep Space Industries Inc., are currently developing unmanned spacecraft and telescopes to identify — and ultimately mine — asteroid targets.